Book Review - "A Man in the Making"
Rick Johnson's latest book is a must read if you have a son. "A Man in the Making: Strategies to Help Your Son Succeed in Life," is a book that will inspire you to raise and teach your son to be an influential, and Godly man. This book in filled with examples from well-known and loved men throughout history including Abraham Lincoln, Benjamin Franklin and John Wooden. Each chapter focuses on a specific character that a honorable man from history emulated in his life, and it is addressed in detail, encouraging the reader to help his or her son develop this trait in his own life. I really enjoyed this book and while my son is still very young, the years will fly by and soon he will be a man and my desire is that he will be a honorable and successful man in all areas of his life. Rick Johnson does an incredible job of being to life these influential men through his account of their lives and how they lived their lives. I found the book not only very interesting, but very inspiring as well! Love and Loss in the midst of war - Book Review - "On Distant Shores"
Enter Today - 8/15 - 9/2! I have enjoyed all of Sarah Sundin's books and I have to say that "On Distant Shores," book 2 in her Wings of the Nightingale series, is her best book yet! I loved getting to read about the flight nurses once again and especially getting to know Georgie better. Georgie and Hutch are both such great main characters and Sarah does an excellent job of developing their friendship and feelings for each other throughout the story. This book is full of historical details and events, but also really delves into the characters' lives and really allows the reader to get to know them. As Georgie returns back to the States, she discovers some secrets and truths come to light which change the secure lives that Georgie and Hutch both thought they had. A year is a long time to wait to read book 3 in this series, Kay's story, but it will be well worth it! To read other reviews on this book go here! Book Review - "The Icing on the Cake"
I was so excited to get book 2 in Janice Thompson's Weddings by Design series and I enjoyed everything about this story! "The Icing on the Cake" focuses on Scarlet, the owner of Let Them Eat Cake, a bakery on the Strand. Scarlet is a fabulous baker and is so busy running the bakery and creating the perfect cake for the upcoming wedding of her best friend. Scarlet is also planning a fund-raiser for her church, in a cake decorating contest, and also trying to sort out her feelings about her employee and also Bella's brother. Scarlet discovers that she really can have her cake and eat it too. I love Janice Thompson's books! They are filled with real characters whom deal with everyday struggles and they are also entertaining and easy to relate to and empathize with. Also, I love the quotes that are included at the start of each chapter. I love how Janice ties in the characters from her other series as I love reading about Bella and her family. Scarlet struggles with her body and her self-esteem, feeling likes she has to live up to others' expectations and pleasing her family; thus leaving her stressed and living a crazy busy life, a life just like many of us are living. I cannot wait to read book 3 in this series and I highly recommend this series! A charming inn, beautiful seaside town, three sisters, mystery, romance....Book Review - "Whispers on the Dock"
Enter Today - 8/17 - 8/31! Book three in the Postcards from Misty Harbor Inn series, Whispers on the Dock(Guideposts Books) is now available. Come back to Nantucket and be enthralled by the final installment of the cozy intrigue of Misty Harbor Inn. About the authors: Evangeline Kelley is the pen name for the writing team of Patti Berg, Pam Hanson & Barbara Andrews, and Camy Tang, the four authors who collaborated to create Postcards from Misty Harbor Inn. Each of them has published novels individually, but this is their first series together. "Whispers on the Dock," book three in the Postcards from Misty Harbor Inn series, written by Evangeline Kelley, is a perfect summery read. While reading this book (and really this entire series!) I was transported to Nantucket and this beautiful seaside inn which is run by three sisters and immediately became engrossed in the story. This story is filled with fun characters, drama, romance, mystery and a beautiful setting. This series tells the story of three sisters whom are searching to find answers to a mysterious woman and find out things about their mother and at the same time as all this they each find true love. This series is a quick read and a great escape to finish out the summer! To read more reviews included on this blog tour go here! 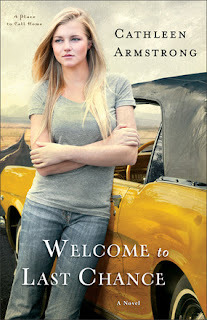 Book Review - "Welcome to Last Chance"
Cathleen Armstrong's debut novel, "Welcome to Last Chance," is a touching story that will immerse you in the characters lives and have you wrapped up in the small town drama. Lainie is running, trying to run far away from her old life; however her car does not let her get as far as she was hoping to go. As Lainie waits to hear to news on her car, she finds herself being enveloped by kind people in his little town off the beaten track and cannot believe the kindness she is receiving as it is not what she is used to. Lainie is realizing that it was more than luck for her to end up in this town and that God may really be looking out for her. This book is the first one in Cathleen's A Place to Call Home series and I am hoping that book 2 will be released soon and will have many of the characters from book 1 returning in it, maybe being Steven's story? This story brings to life small town life - the small town life of everyone knowing each other and everyone else's business, but also everyone being there for each other in times of need. Fayette is an excellent character and mentor to Lainie as well as Elizabeth. These women are such good examples to Lainie and of showing God's love. Ray and Steven have a typical relationship between brothers and both are searching for their niche in the world as Lainie is as well. I highly recommend this book and am looking forward to more books by this author! Book Review - "The Prayer Box"
Lisa Wingate is such a talented author and storyteller and she has proven this once again in her latest novel, "The Prayer Box." Tandi is hiding from her past and has found solace in a rental cottage belonging to Iola; however she fears her time is up when Iola passes. Then Tandi finds herself with the task of sorting through and cleaning out Iola's beautiful home, a home that is filled with memories of Iola's long and rich life. As Tandi begins this task, she discovers boxes and boxes filled with bits of prayer that not only tell a story but teach lessons as well. Lisa is such a masterful storyteller and this is an excellent story that will immediately have the reader immersed in the characters' lives. Tandi is such a wonderful main character, there is so much depth to her character and she is one who is easy to relate with and empathize with. I highly recommend this book, it is one that you do not want to miss out on! Book Review - "Forever Friday"
Timothy Lewis has woven together a beautiful love story in his novel, "Forever Friday," that was inspired by his great-uncle and great-aunt and has resulted in a timeless story that will be enjoyed and remembered for years to come. Adam discovers postcards that were overlooked by the treasure hunters at an estate sale and on these cards he discovers a beautiful love story and relationship from years ago. Adam is struggling with the concept of love forever and believing this can actually happen and yet he finds himself being drawn into the love between Gabe and Pearl. As Adam reads through the postcards filled with poems and love, he finds himself caught up in the romance and the precious vows from so long ago. This novel is one that drew me right into the story and I was transported back in time. I was so intrigued by the concept of this story and the cover is so inviting as well. This story will leave you believing in true love and wanting to go on your own treasure hunt to discover a set of postcards and pictures that tell a story. Lewis is a very talented writer and storyteller and one I am looking forward to reading more novels by. Book Review - "A Hopeful Heart"
In A Hopeful Heart, the first novel of the new Hearts of the Lancaster Grand Hotel series from best-selling author Amy Clipston, Hannah finds herself at a crossroads in her life. Her community offers her love and support after the untimely death of her husband, but an Englisher offers her the chance of a new life after her unexpected tragedy. Wealthy businessman Trey Peterson is surprised by his attraction to the gentle Amish woman who works as a housekeeper in the Lancaster Grand Hotel. They share a common bond of loss and are able to offer each other comfort and support as they journey through their grief. Amy Clipston's latest series, Hearts of the Lancaster Grand Hotel, begins with book 1 "A Hopeful Heart" and this book will not disappoint Clipston fans! Hannah has lost her husband and she feels lost overall. Hannah is forced to make choices in order for her own survival and happiness. However, she is faced with making a choice, not only between two loves, but between two lives as well. I really enjoyed this book as it really delves right into difficult subjects and choices. A person's life can change so completely and unexpectedly in a second and along with the difficulty of dealing with the pain, life moves on. Hannah must follow her heart, but also listen to and trust God in making choices for her life. This is a well-written novel and a great start to the series. Last summer there was a Blueberry Pie recipe shared on a blog that I follow (and love reading! ), but I didn't get a chance to make it during blueberry season. Finally, on Thursday night I had the chance to make it and it turned out well! Here's the link to the recipe: blueberry pie recipe! 2. Mix sugar, cornstarch, salt, and cinnamon, and sprinkle over blueberries. 3. Line pie dish with one pie crust. Pour berry mixture into the crust, and dot with butter. 4. Cut remaining pastry into 1/2 - 3/4 inch wide strips, and make lattice top. Crimp and flute edges. 5. Bake pie on lower shelf of oven for about 50 minutes, or until crust is golden brown.